Alexis Sanchez "worries" people have not seen the best of him yet at Manchester United and says he "would like to have brought more joy to the club". In a wide-ranging interview alongside team-mate Ander Herrera with the BBC, the Chilean winger also discusses his struggles at Old Trafford under former manager Jose Mourinho. Herrera backs Sanchez to be "important" for the club and says interim United boss Ole Gunnar Solskjaer has "brought the smiles". Sanchez has failed to replicate his form at Arsenal since joining United in January 2018 on a four-and-a-half-year deal worth a reported £14m a year. Coupled with injury, he has scored just five goals in 37 appearances. He came on as a substitute for the injured Jesse Lingard late in the first half of the 2-0 Champions League defeat by Paris St-Germain on Tuesday and was widely criticised for an underwhelming performance. But the 30-year-old confirmed reports he was injured after an assistant referee ran into him as he warmed up on the sidelines. 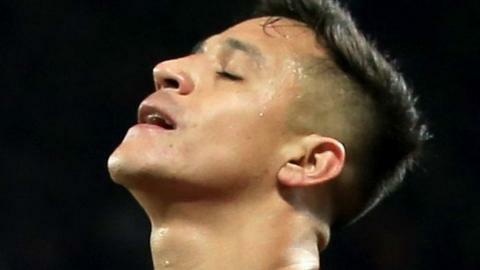 Sanchez said: "The referee's assistant, when we had a counter-attack, came flying down the line, and I had my foot there and he crashed into me. Bang. "And I went back to the dugout and I said to [reserve goalkeeper] Sergio Romero: 'I've just been whacked and I'm about to go on'. "I've got bruising but that's not an excuse for not being on my game in the way that I normally am." Sanchez has started just three games under Solskjaer, with Frenchman Anthony Martial, 23, preferred on the wing instead. "He [Solskjaer] hasn't spoken to me a great deal about what I have to do on the pitch, but I think I'm an experienced player and I think I know what I need to do and what I shouldn't do," said the former Barcelona player. "I'm a player that, if I'm not in contact with the ball, I lose that spark, and sometimes I want to play in every game. You're in, you're out, and I'm used to playing. "It's not an excuse because if I go on for 10, 20 minutes, I have to perform because that's what I'm here for, to make a difference. "I would like to have brought more joy to the club. Yes, it worries me because I believe in my abilities as a player, I want to show it." He added: "I don't know how people see me, but football is what I've loved from being a kid and it's my passion." Spaniard Herrera says Sanchez is "always in the gym first", adding: "I have big expectations for Alexis because he's a fantastic player and he's a fantastic professional. "He wants to be important for the club and I'm sure he's going to be. The only thing we can tell him is that we all believe in his qualities, we know what he has. "We all know what he is capable of, and he's going to do it, so you will see it soon. I think he should be very calm, because he has everything to be a top player in this club and he will be." Mourinho was sacked in December after a run of poor results, culminating in a 3-1 defeat by Liverpool that left them 11 points off fourth place in the Premier League. United are currently fourth in the league after Solskjaer won 10 of his first 11 games before Tuesday's 2-0 Champions League last-16 first-leg defeat by PSG. "Mourinho is one of the best coaches in the world, in the way that he coaches, how he studies videos, the way he goes about things," Sanchez said. "But within the group there was that feeling that you were in the team, then out. Sometimes I didn't play, then I did, then I didn't and as a player you lose confidence." He added: "I've played football since I was five and if I have the ball taken away from me, it's as if I lose my joy." Herrera added: "Mourinho gave me a lot of things that I will always be thankful for and Ole brought the smiles. "He gets the best from the most talented players. He speaks personally, he goes one-by-one. He knows what the club was about and he reminds [people] of [Sir Alex] Ferguson and that's a big step that he has already made. "I hope it continues to work for a long time, because he's a fantastic guy as well." United lost Lingard and Martial to injury either side of half-time against PSG before Presnel Kimpembe headed in from a corner on 53 minute and Kylian Mbappe doubled their lead on the hour mark. The three-time European champions face an uphill battle in the return leg of the last-16 tie at Parc des Princes on 6 March. It comes in a tricky run of fixtures that includes Chelsea in the FA Cup fifth round on Monday evening and Liverpool in the Premier League the following Sunday. "I think until the PSG goal, they weren't the better team," said Herrera. "I think if that corner wouldn't have happened, probably the result would have been 0-0. "I think we are going to learn a lot from that game and we are going to be stronger." Sanchez added: "When they scored that first goal, I looked at them [team-mates] and I thought, no, something's not right. "I looked in their eyes and I thought, there isn't that feeling there [of coming back], I'm not getting it."